Pain Physicians NY in Brooklyn, NY the best rated sports injury clinic and is one of the first practices in New York to offer Platelet Rich Plasma (PRP) Injections for patients suffering with knee pain. Our facility equipped with the most advanced, cutting edge equipment to treat pain. Tendonitis of the knee is one of the most common kinds of knee pain. However, it’s easily treated. People who are physically active or who participate in sports tend to develop tendonitis at one time or another. Tendonitis of the knee is an injury occurring around the knee affecting the tendons that connect your shinbone to the kneecap. 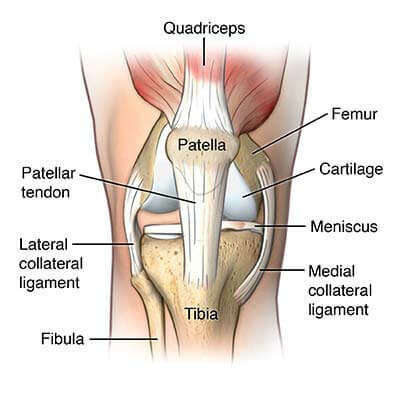 The kneecap is technically referred to as the patella, hence the name patellar tendinitis. The function of the tendons is to transmit the pull of the muscles to the bones, to enable movement, but tendonitis of the knee makes these tendons inflamed. While inflamed, any activity associated with the affected tendon becomes painful or uncomfortable. Tendons around the patella connect your shinbone to the muscles at the front of the thighs, facilitating the bending and stretching of the knee. Injury to these tendons is common among athletes who jump regularly like basketball players, although it can even affect inactive individuals. Overuse, however, is the most common cause because it strains the tendons, leading to its inflammation. Pain and discomfort directly over the knee cap may be an indicator of tendonitis. The severity of the pain may vary, though, becoming disabling in some but only causing discomfort in most. Regardless of the intensity, pain is usually exacerbated by physical activity involving the knees as the inflamed tendon rubs over the kneecap. Another type of pain that could be caused by tendonitis of the knee is called Jumper’s knee. This pain is different because it is felt just below the kneecap and closer to the shin bone than the kneecap. As the name suggests, it is caused by too much strain on the tendons in the knee resulting from too much jumping. Ice – apply ice wrapped in a towel directly onto the affected knee for about 15 minutes perhaps once or twice a day. This helps the tendon heal faster and also reduced the pain. Rest – you shouldn’t perform any exercises while the tendons are inflamed as this may slow down recovery and even make the condition get worse. If possible, abstain from any kind of physical activity for a couple of days. As you rest, make sure the leg is elevated above your body using a pillow to enhance the blood flow. Medications – there are a variety of anti-inflammatory medications available over-the-counter that you can take. These will help reduce the inflammation and also the pain at the same time. Compress your knee – wrap the affected knee in an elastic bandage to reduce the swelling. After a few days, the pain should subside and you can resume regular activities. However, ease yourself back into any intense activities to avoid flaring up the condition. Those who get back to intense exercises soon after recovery risk contracting tendinopathy which is a more serious condition. Tendinopathy may require the use of corticosteroid injections and even surgery, and these could have further consequences. It’s always better to take it slow and avoid such complications, allowing your body to heal on its own.